A men’s and ladies’ technical short-sleeve base-layer crewneck tee, featuring accent contrast panels and flatlock construction. Can be colour blocked or sublimated for customizing. Boardroom Custom Clothing is an environmentally conscious custom apparel design and manufacturing company, funded in 1996, and specializing in manufacturing technical, fashionable, and low-impact clothing solutions using organic and recycled materials. 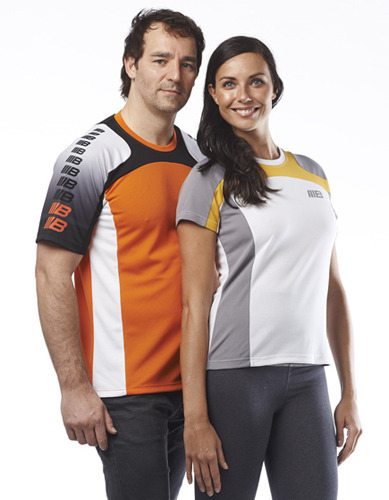 For example their Relay Tee is made from Broadroom’s Eco®Tec material, a lightweight, wicking, breathable technical fabric engineered for comfort and performance, made from 40% recycled polyester., and 60% regular polyester. (Broadroom’s also offers Ecotec100, which is made from 100% recycled polyester). The Relay Tee is available in a number 8 stock colors (white, black, ash, red, orange, gold, green, and pacific blue) and can be custom colored for large custom orders. The tee comes in both male and female cuts. Broadroom does their own decorating on location, so it is easy to get virtuals and proof for you orders, direct from the factory. In most cases decoration on the Relay Tee is done via sublimation. This is a great shirt to run in, bike in, or work in, very light weight, very breathable. If you are interested in the Relay Tee to promote your own business, or to get a sample, email info@proformagreen.com for information and pricing.